Where are all the Emus? Recently we began another road trip, once again visiting family in Sydney. From home in Murray Bridge, South Australia, it is just over 1300 kilometres or about 14 hours actual travelling time. Whenever we stop, I try to jot down a list of all of the birds I see or hear. When it is my wife’s turn to drive, I am able to concentrate on the birds I see as we are driving along, listing them in my notebook as I see the birds. Sometimes, if I see something unusual, or noteworthy, I will even ask my wife to note this in my notebook when I am driving. She is great that way – and she even points out birds I may have missed. On all of our trips over to Sydney, I particularly enjoy crossing the Hay Plains between the towns of Balranald and Hay. To most people, this is a dreary, featureless plain covered by saltbush. We find it endlessly fascinating, watching the subtle changes in vegetation as well as the birdlife along the way. On this trip, we saw quite a few birds of prey, something which is not surprising due to the frequent encounters with roadkill. Many kangaroos, rabbits and foxes are killed by the hundreds of trucks traversing this route day and night. We saw plenty of Black Kites, Black-shouldered Kites and Nankeen Kestrels but no Wedge-tailed Eagles which is surprising. This time the grand total of Emus was one. In fact, it was the only Emu for the entire 1300km journey. I cannot account for the absence of Emus on this trip. Perhaps there was no food for them near the road, or they are nesting away from the road. Maybe we will see more on our return trip in three weeks’ time. Emu article on Birds in Backyards site – plenty more information about this species. Trevor, my wife and I are from Canada and are enjoying our first vacation in AustraliaI. I’m only a novice spotter have enjoyed the occasional dip into your pages. When I visited Sydney on business 9 years ago I bought a copy of Slater’s Field Guide and with the help of this I have reliably identified just short of 70 different species on the trip. There have been many more part glimpses and inconclusives. We just completed the Balranald to Hay section of the Adelaide to the Blue Mountains section of our trip. I was driving so concentrated on the section of road between the wire fences; however, my wife with a bit of peripheral help from me counted 32 Emus during the journey, mostly in groups of three sometimes four. We also saw what I’m reasonable convinced was a Nankeen Kestrel perched on a fence post (previous sighting of one of these while staying in Apollo Bay). There were also a number of kites but I was unable to confirm which species. I do have a question for you. Earlier today I spotted a bird of prey. It was average hawk size was light underneath with dark (black) tail and wing-tips. this was somewhere along the PInaroo to Ouyeen section of road. Not much to go on I know but could you give me any pointers as to what it might have been. Welcome to the delights of birding in Australia. 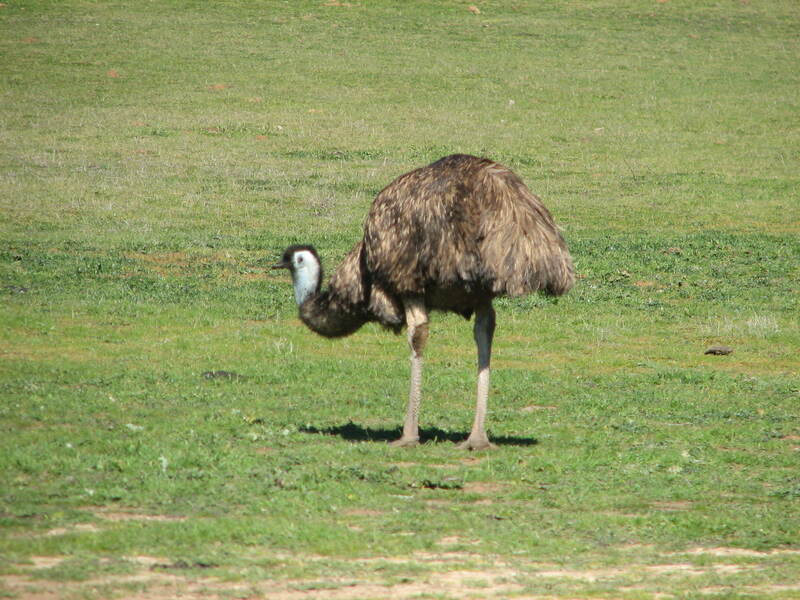 On our recent return trip from Sydney in mid-October, we did see plenty of Emus. I can’t recall the actual count but it was certainly well over 20. The kites you saw were probably Black Kites (which are actually a dark chocolate brown) with the diagnostic V-shape to the tail. (Not wedge shape as in the Wedge-tailed Eagle). The Hay Plains often have many Nankeen Kestrels, often perched on posts and power poles. As for your question, I immediately thought of Black-shouldered Kite which is similar in size to the Kestrel, but it has no black on the tail. The next best suggestion I can make is the Australian Hobby (also called Little Falcon). These are relatively common in the area you describe. Hope this helps, and I hope you enjoy the rest of your holiday.